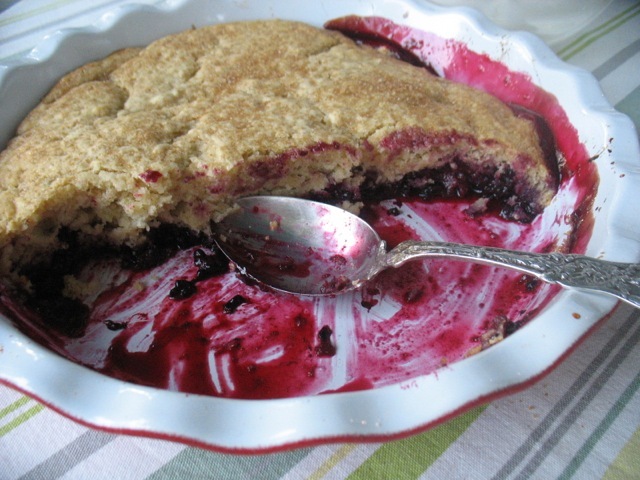 The winey, warm taste of bubbling blackberries topped with the simplest possible biscuit-like crust has broken the blogging hiatus this summer. 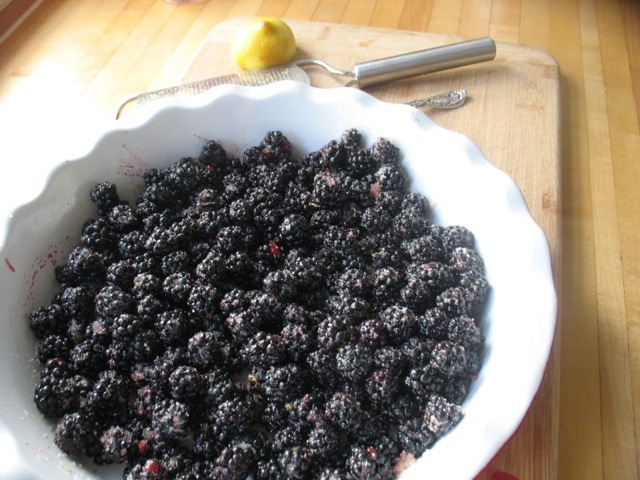 My six-year-old has been asking for weeks now when I would make this summer’s blackberry slump. He mostly likes saying the word slump, as do I, and today was the day. My arms and ankles still show the tell-tale signs of picking blackberries on an empty lot where you fight your way too far into the thicket for the biggest and best looking berries. Eight pints of barely sweet jam flavored with lime zest and just a little cinnamon are safely in the basement and the rest made this dessert the epitome of summer desserts. I’m sure juicy peaches and/or plums would work well as would other berries. This is not a very sweet dessert. If you prefer things on the sweeter side feel free to increase the sugar a bit. 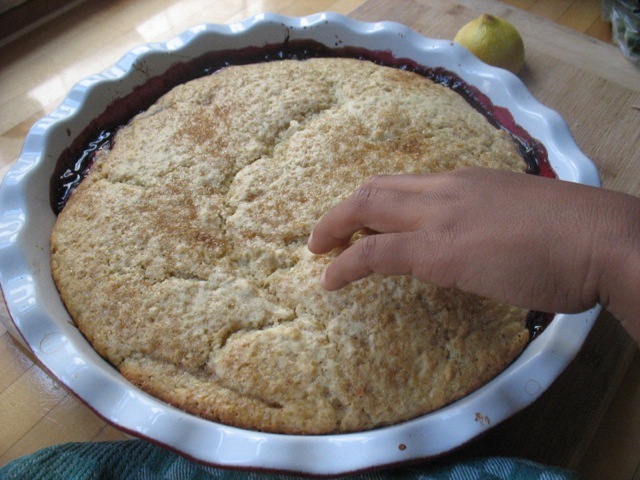 Mix the above (only have the zest though) gently in a large, deep (10-11 inch) pie dish (as pictured) or a 8 x 13 or other similarly sized baking dish. In a mixing bowl whisk dry ingredients thoroughly. Add milk and melted butter all at once and whisk quickly and until just combined. Pour/spread over berries. You don’t need to cover them perfectly or evenly. 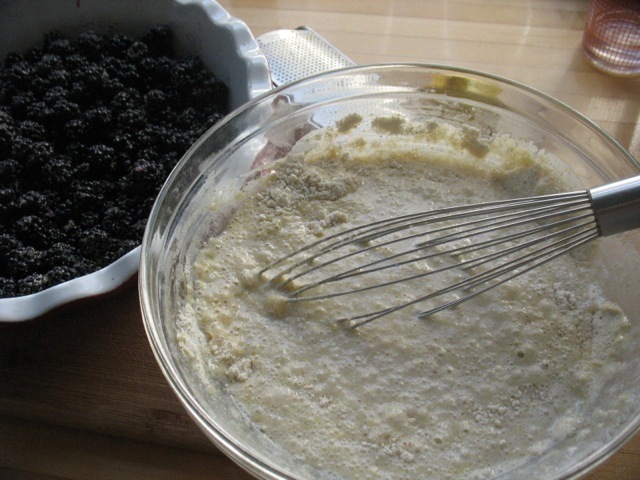 Sprinkle on the coarse sugar and bake for 35 – 45 minutes until the berries are bubbling around the edges and the crust is golden brown. Let rest for a bit. Serve warm with barely sweetened whipped cream. Eat the rest for breakfast or share with your neighbors. It’s awfully good on a warm summer’s night. Ellis testing whether it’s done. No toothpick needed! Last night I did something I haven’t done for a long time. I puréed vegetables in order for my son to eat them. He has plenty of teeth mind you (he is 3 years old!) and capacity to chew so that was not the reason. For the last week or so, we’ve relapsed into the negotiations over vegetables and I was simply tired of it. I sautéed onions, carrots, chard stems and added a bunch of collards and some veggie broth. Then I pureed the whole thing, added it to a small batch of cream sauce and baked it with pasta and a bit of cheese for a very-veggie-heavy “mac-n-cheese”. He devoured two bowls full with a grin on his face and asked me to be sure and save some for him for after school today and not send ALL of it to work with Daddy! Why did I feel so compelled to do this? I love vegetables and I don’t like days without them. I probably love vegetables in part because I grew up eating them and watching my mother grow them. And they’re so beautiful. I also did this because I want my son to be healthy and strong and well-nourished and I’m convinced deep down in my soul that having good vegetables everyday is a part of that. And I know that he likes vegetables but somehow those green and orange pieces would otherwise have been meticulously eaten around and left in the bowl – unless we’d launched said negotiations which tend to end with the promise of dessert! But I digress, my point is that vegetables matter–flavor, nutrients, variety, color, cultural markers, history, beauty, and more flavor! I’m grateful for the variety and quality of vegetables surrounding me in my garden, my CSA share, the farmers markets and in some of our grocery stores. And that makes me grateful to our many local farmers, who have not had an easy go of it this spring. When my broccoli is devastated by cabbage worms and my basil and peppers succumb to slugs, I’m frustrated but I still get my CSA every week and the markets are still abundant. But in order for that to be the case, so much creative energy, knowledge, skill and hard work is applied to those fields every day and for that, I am the most grateful. And while last night’s pasta dish was perfectly fine, I don’t think any of you need the “recipe” so instead I’m going to direct you to this week’s blog post from Sauvie Island Organics in which I’m the featured “chef” and there you will find six new recipes to put all these wonderful veggies to use. P.S. 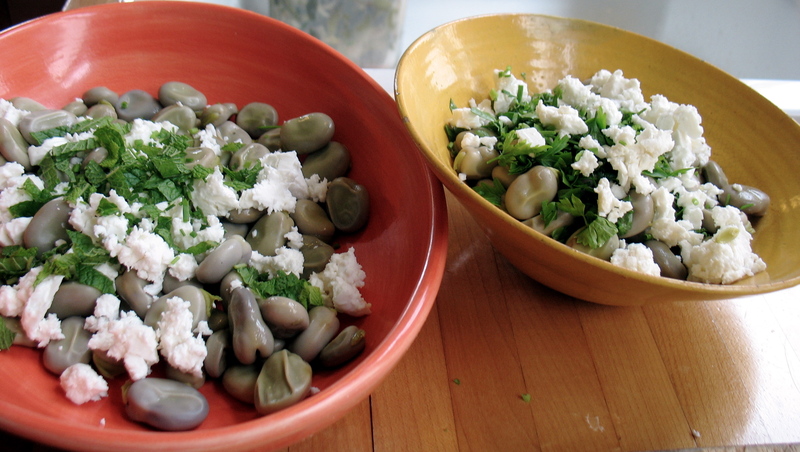 Summer Cooking Class Schedule at Cook With What You Have!